Harmony of high glossy and semi matte lipstick. Complete moisturizing and gloss lip with new types and colors of 2016 new two tone lip bar. Artistic color match. Upgraded high pigmentation and artists' color match create vivid and vibrant lip makeup. Quick touch gradation. Anyone can create lip makeup by artist's natural auto gradation. Sorbet-like soft and dewy texture. Creamy texture is applied t lip smoothly and make lips gloss. The product is popularized by the Korean drama Descendent of the Sun. There are a few shades of the Two Tone Lip Bar are seen in the product placement throughout the drama. After the feature, the lipstick is sold out immediately in Korea. As described, the lipstick creamy and smooth. It does feel that way when applied. The color is sheer with one coat and it is buildable with multiple coats. The color that I picked is called Juicy Pop, which is a combination of yellow and bright pink. Amongst all the colors, this is the brightest and has the weirdest combination. How do pink and yellow looks like if combined together? It is interesting enough to catch my eyes. Laura's review on the same shade also triggered me to pick up the same color. The finishing is creme sheen. Usually creamy lipsticks don't have long staying power. However, this is one exception. It lasted about 4 hours without any touching up to reapply. It does stain coffee cups. So prepare to reapply after every meal. Generally, I find the staying power is pretty decent and the moisture lasts very long as well. The texture is one winning factor. It is creamy, moisturizing and long lasting. Those are the main things I always look for in a good lipstick. The color is also revolutionary. I have never seen shades like yellow and bright pink in one tube. If you are expecting a nicely done gradient on your lips, it won't happen there. After a few uses, I realized that both the color are from a different spectrum, so you can't get the light to dark ombre effect. However, they make a nice crimson pink color when mixed together. The Two Tone Lip Bar has 14 different shades, I believe those shades that aren't too contrasting can create a better ombre effect. What is worth mentioning also, the retractor of the product works the other way round. One mistake, in opening the product, you may ruin the lipstick. To reveal the lipstick, you have to push the level down and vice versa. It will make sense once you get your hands on the actual product. Yes, I think you should get it. Not only it is a fun and trendy product to try, it is also a very good lipstick by itself. If you are looking for a full ombre go for the shade Maxi Red, Dear Pink or Pink Step. 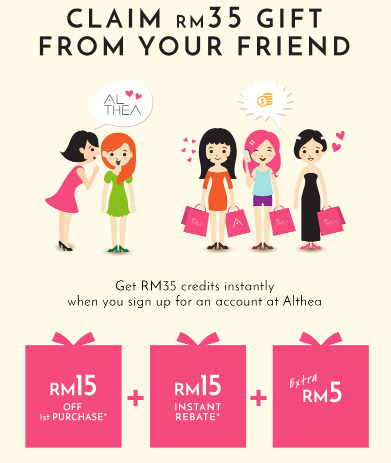 Of all the sales point, Althea has the cheapest price (RM68). And if you decide to purchase from there, I have a discount coupon for you. Just follow <<this link>> and register, you will receive RM35 credits in your account.